I love eating grilled pizzas. The crust has that certain crispiness and char that oven baking just can’t replicate. As much as I have read about how easy grilled pizza is to make, I must admit I have always been intimidated by the process. The idea of having to maneuver dough on to hot grill grates as it is sticking to your fingers while (what feels like) searing heat singes your forearms always scared me off. Ask me to do the same thing over a hot skillet on the stovetop and I wouldn’t even bat an eyelash. But direct heat sends me running. So, I can’t tell you how happy I am to have found a solution to this problem. Considering I only learned to light our gas grill a couple of weeks ago to make this recipe, I can truthfully say that even a grilling novice can handle this process. The idea is to pre-cook the pizza crusts in a skillet first. It is much easier to roll out the crust and transfer it to a skillet when you are indoors working in your kitchen. Once you pre-cook the crusts, you can store them in the refrigerator for several days. Then when you are ready for some hot-off-the-grill pizza, just top the crusts with your toppings of choice and pop the pizzas on the grill for a minute or two. The pre-cooked crusts transfer to the grill effortlessly with a spatula. If you are planning a make-your-own-pizza party, double or triple the dough recipe as necessary and have several crusts ready for topping. Since the pizzas need only a short time on the grill, no one has to wait very long to enjoy their creation. Of course, you can get very creative with the toppings. Since I wanted to focus on sharing this recipe for the dough and this technique for grilling pizzas, I decided to keep the toppings for this pizza very simple. It is Margherita inspired with 2 kinds of cheese topped with fresh tomatoes and basil. These super cute San Marzano plum tomatoes I found at the store were perfect. We also like the combination of asiago, mozzarella, caramelized onions, and prosciutto. I wish I could show you how beautifully grilled these pizzas are on the underside. There are perfect grill lines and everything. Remember, I only started grilling a few weeks ago so perfect grill lines make me really happy. They were absolutely gorgeous – and mighty tasty too! In a glass measuring cup, add water, yeast and sugar. Stir until the yeast is dissolved. Let sit for 5 minutes. A thin layer of foam should appear on the top indicating the yeast is active. If a thin layer of foam does not appear then throw out the mixture and start again. Check that your water is not too hot or cold and that your yeast is not expired. In the bowl of a stand mixer fitted with a dough hook, whisk the all-purpose flour, whole wheat flour, salt and cornmeal together. Add the yeast mixture and 2 tablespoons olive oil. Mix 2-3 minutes on low speed using the dough hook until the mixture comes together. Spread the remaining teaspoon of olive oil in a thin layer on the inside of a large bowl. Gather the pizza dough into a ball and place it in the oiled bowl. Turn the dough around so that it gets coated with the oil. Cover the dough with plastic wrap and let sit in a warm place until it doubles in size, about 2 hours. After the rising time, move the bowl of dough to the refrigerator to chill for at least 1 hour (or overnight if possible) to firm up the dough and to enhance the flavor. This will also make it easier to roll out. Take the chilled dough out of the refrigerator and punch it down. Divide the dough into four equal parts and shape each part into a ball. Work with one ball of dough at a time. On a lightly floured surface, use a rolling pin to roll dough into an 8-inch flat circle. Heat a cast iron skillet over medium heat until hot. Brush olive oil on inside of the pan then gently transfer the rolled out dough to the hot pan. Cook for 1-2 minutes or until the underside is lightly browned. Brush olive oil on the top of the crust then flip the crust over in the pan. Cook until the second side is lightly browned. Repeat with the remaining balls of dough. At this point, you can proceed to the next step of making your pizza or you can allow the crusts to cool on a plate or wire rack. Then wrap the crusts in plastic and store in the refrigerator for 4-5 days. Bring the crusts to room temperature if they have been chilled. Brush olive oil on both sides of each pizza crust. Top each pizza with freshly grated asiago cheese and slices of fresh mozzarella. Using a spatula, transfer the pizzas to the grill placing them directly on the hot grates. Close lid and cook for 1-2 minutes until cheese is melted and underside of crust in nicely browned. Remove pizzas from grill and top with tomatoes and basil. Cut each pizza into quarters and serve. Recipe for pizza dough and cooking technique from Grilled Pizzas and Piadinas cookbook. Loving the look of these pizzas! 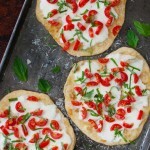 You can never go wrong with mozzarella, basil and tomatoes.. craving a bite of one right now!